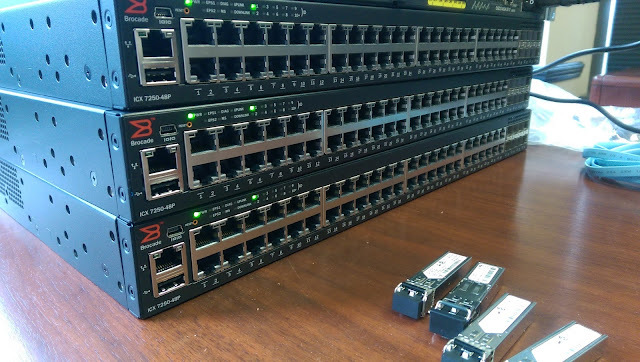 I've been putting in some Brocade ICX7250 switches recently, which is the new low end enterprise access closet switches Brocade has out now for the ICX series. These are really worth a look. Up to 256Gbps switching backplane, up to 190Mpps, 80Gig stacking capability (up to 12 in a stack), SDN capable, with 8 10gig ports. And cheaper than a ICX6450. This could act as a core for a small office. I would not hesitate to do that. It does L3 and performs well. Hi shane, thanks for posting this. I less worked with Brocade network products. I like your post which is comparing cisco and Brocade product.